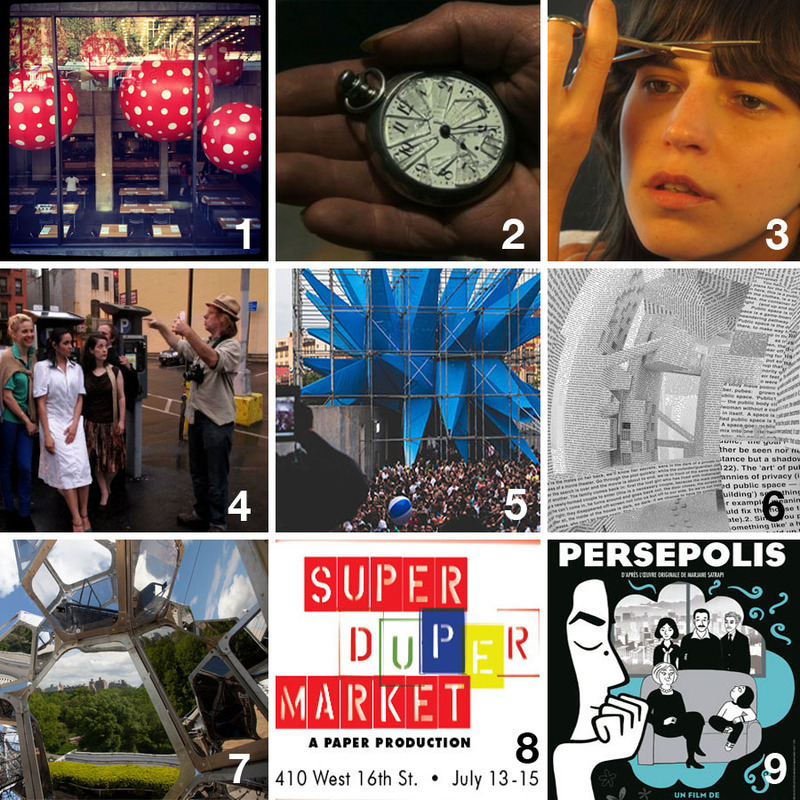 If you’re in New York City this summer weekend, there are more free and cheap things to do than time to do them. Here are just a few that look especially interesting to us…too bad we can’t be in more than one place at a time. 1. Art – The Yayoi Kusama Retrospective opens at the Whitney Museum. Friday nights from 6-9pm admission is pay-what-you-wish, otherwise general admission is $18. Can’t make it this weekend? Don’t fret, the exhibit runs through September 30th. And if you’re downtown be sure to check out the lawn installation at Pier 45, Hudson River Park. 2. Art/Film – Christian Marclay’s The Clock opens July 13 through August 1 at the David Rubenstein Atrium at Lincoln Center. FREE. Prepare for long lines. 24-hour video collage. 3. Music – Eleanor Friedberger with Ex Cops. Friday, July 13th at 7pm; Pier 17 at The Seaport. FREE. Also: for a more Latin evening: Calle 13/Ana Tijoux/Ritmo Machine at the Prospect Park Bandshell in Brooklyn. Friday, July 13 at 7pm. FREE. 4. Theater – Shakespeare in the Park(ing) Lot – “The Merry Wives of Windsor” July 12 to 28. Municipal Parking Lot at the corner of Ludlow and Broome. Thursday – Saturdays at 8pm. FREE. Also: Twelfth Night presented by New York Classical Theatre at Castle Clinton, Tues through Sun, till July 22th at 7pm. FREE. 5. Art/Architecture/Music – Warm Up at PS1, Saturday July 14 at 3pm with Terrence Parker, D3, Ron Morelli, Jeremie Delon, and Steve Summers. Check out Wendy, see Lara Favaretto’s exhibit Just Knocked Out, and dance the evening away. $15. Free for MoMA members. 6. Graphic Design – Now in Production is Cooper-Hewitt and Walker Art Center’s exciting exhibit exploring some of the most vibrant sectors and genres of graphic design today. Open weekends through September 3, 2012 in Building 110 on Governors Island. FREE. 7. Art – Tomas Saraceno’s Cloud City on the roof of the Met. (See our previous post) Through November 4, 2012. 8. Food – Paper Magazine’s Super Duper Market. July 13-15. Pop-up super-store bringing the coolest food artisans and innovators under one roof. 410 West 16th Street, between 9th and 10th Avenues. 9. Film – Persepolis on Pier 1 (Riverside Park near 70th Street), Friday, July 13, 8:30-10:30pm. FREE. And you might be interested in contributing to Bike-In-Theater’s Kickstarter so that they can get their events going this summer as well. This entry was posted in Art, Event, Film, Food, Fun, Graphic Design, Music, NYC, Stuff We Like. Bookmark the permalink.